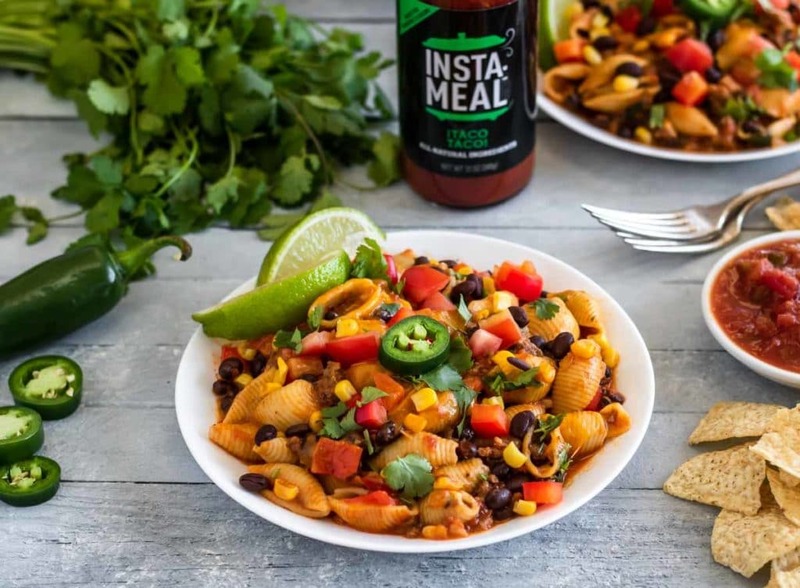 Taco Pasta is delicious, but make it in the Instant Pot in 4 minutes and it is even better. 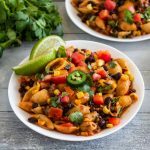 This recipe for Instant Pot Taco Pasta is a perfect weeknight family dinner that everyone will love, even your kids! 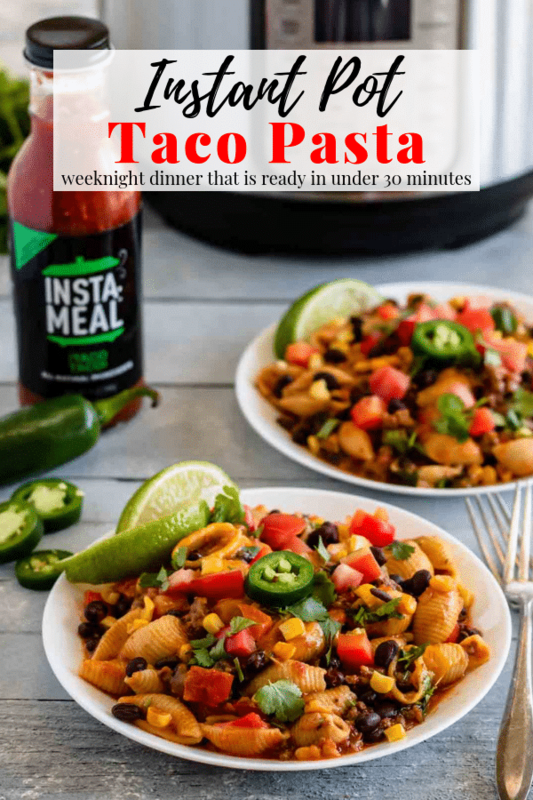 Perfectly cooked pasta shells are mixed in an amazing tomato based Instant Pot taco sauce that is seasoned perfectly. Ground beef, corn, black beans, cilantro and cheese are mixed in to make this dinner complete. 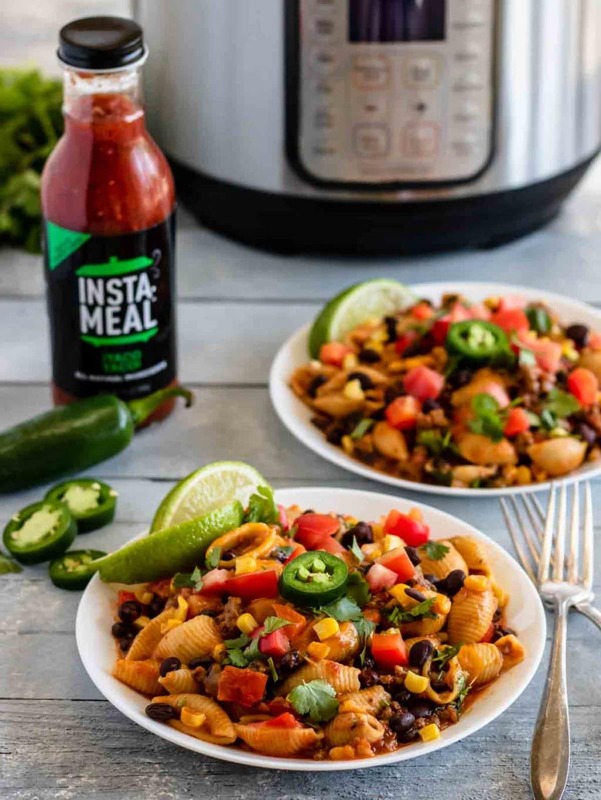 I partnered with Insta-Meal Sauces on this post. All opinions are my own! Scroll down to enter the INSTA-MEAL GIVEAWAY! 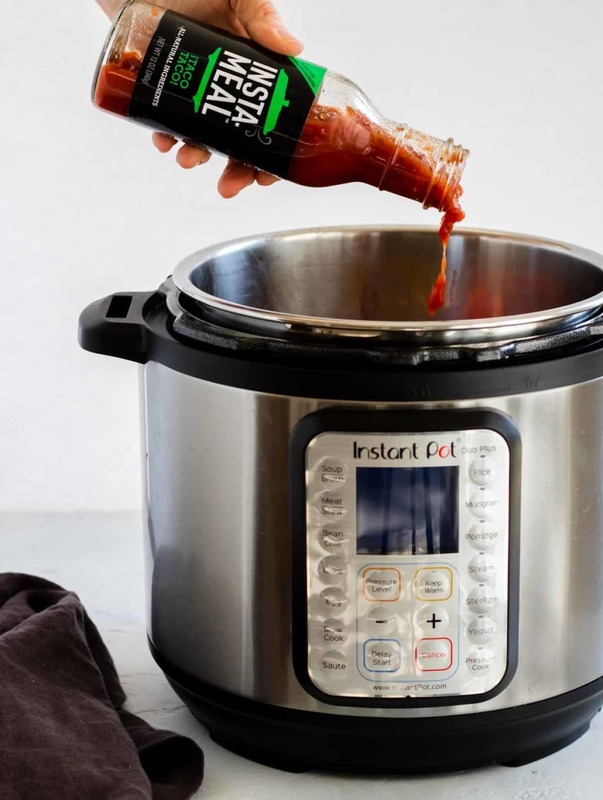 These sauces take the guesswork out of making or finding a sauce that is Instant Pot compatible. They are huge time savers not only in the kitchen, but also at the grocery store. Instead of buying 7 extra ingredients to make the taco pasta sauce, everything you need is already in the bottle for you! And they taste AMAZING!! There are more recipes to come using the other flavors. 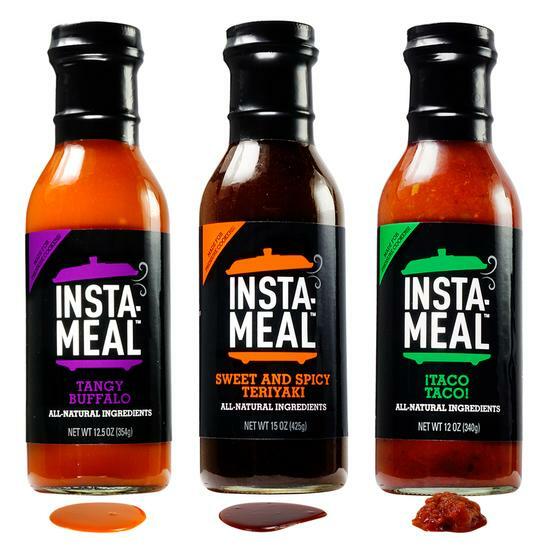 You can buy these sauces in a 3 pack or individually, and if you have Amazon Prime, they will be to your house in no time! Click the links above to purchase on Amazon (affiliate link). Sorry, this giveaway has ended. But please stick around for the amazing free recipe at the bottom of this post!! 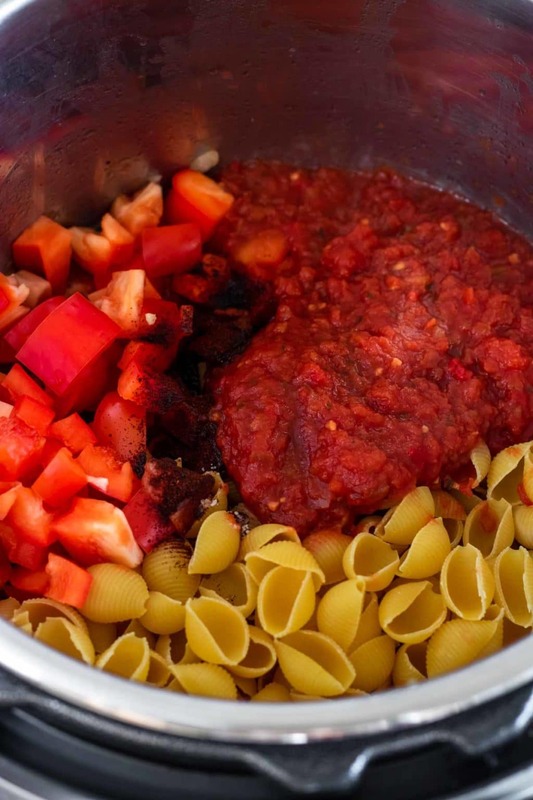 When I first got my Instant Pot, I didn’t believe that you could make pasta in 4 minutes! I would always add extra time because 4 minutes sounded crazy to me. But, truly that is all you need and your pasta cooks perfectly. Most recipes will give you an exact amount of liquid to use in with an Instant Pot pasta recipe. But if you are winging it with a different amount of pasta, simply use enough liquid to just come to the top of your pasta, with a few pieces peeking out of the water. Only set your pot for 4 minutes! I know it sounds crazy, but that is the perfect amount of time. Do not pressure cook with cream sauces, like alfredo. Cook the pasta in a liquid, then add the cream sauce, cheese, thickeners after it cooks. Make sure that all the pasta is touching the liquid. It does not all need to be submerged, but it needs to at least be touching the liquid. Don’t forget to add a few pinches of salt to the pasta and water. This is your chance to actually flavor the pasta itself! Turn the Instant Pot onto saute mode, once it reads HOT you will soften the onions and garlic in the oil for a few minutes. Next add the ground beef and crumble it into bite size pieces while cooking, this will be about 5 minutes. It’s ok if there is some pink remaining, it will cook thru during the pressure cooking. Turn off saute mode and drain the extra grease from the pot, then put the beef and onions back in the pot. Stir in the diced bell peppers, medium shell pasta, Insta-Meal Taco Taco Sauce, chili powder, salt, and 2 cups of water. You want to make sure you get all the sauce out of the bottle, so pour 2T of water into the now empty sauce bottle, swirl it around and pour it into the pot. Stir all the ingredients together and very lightly press the pasta so that it is at least touching the liquid. Place the lid on the pot, lock the pressure valve to “seal”, and set the pot to pressure mode, on high, for 4 minutes. After it is done cooking do a quick release of pressure. Stir in the black beans, corn, cilantro, and cheese. Let the pasta sit for 5 minutes before serving this will let any liquid absorb and the cheese to melt. 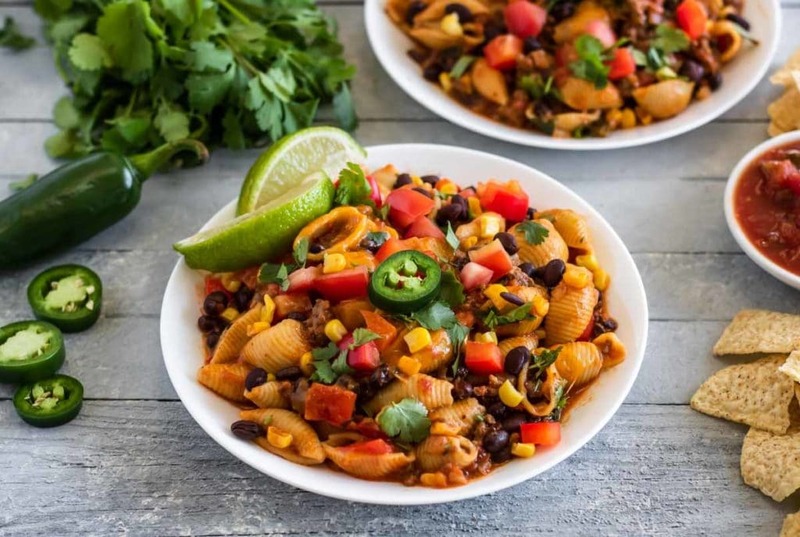 You can garnish the taco pasta with additional cilantro, diced bell peppers, diced tomatoes, jalapenos, avocado, extra cheese, sour cream, or plain Greek yogurt. Really anything you would like on burritos or tacos would work on top of this Mexican pasta. 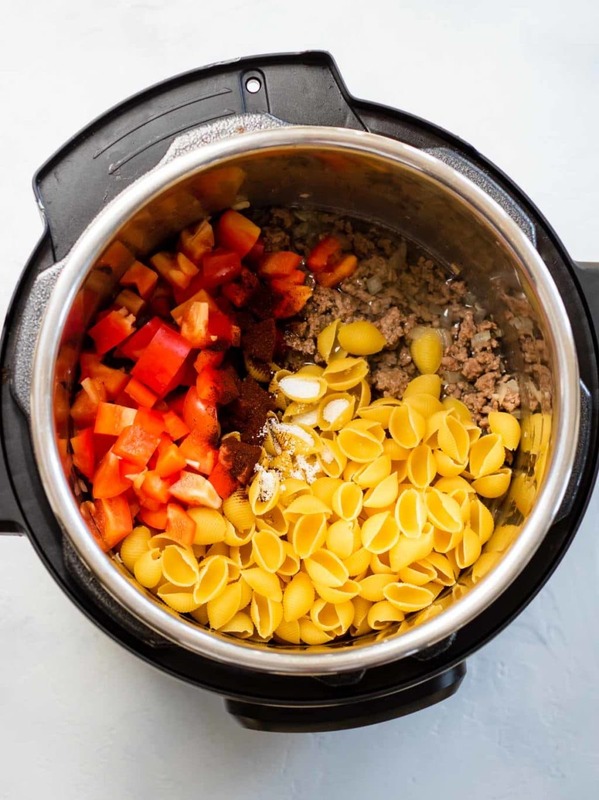 I hope you give this Instant Pot Pasta recipe a try in your kitchen! 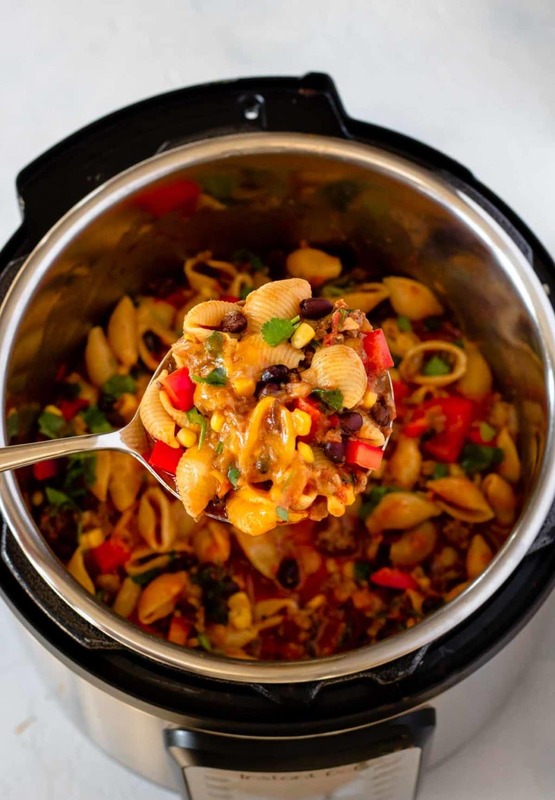 Taco Pasta recipe cooked in the Instant Pot for 4 minutes. This is an easy and delicious instant pot pasta recipe that makes a wonderful weeknight family dinner. With the Instant Pot on saute, soften the onions and garlic in the oil for a few minutes. Add the ground beef and crumble while cooking, for 5 minutes. Turn off saute mode and drain the grease. Add the beef and onions back to the pot. Stir in the peppers, pasta, Taco-Taco Sauce, chili powder, salt, and 2 cups water. Stir all the ingredients together and lightly press the pasta so that it is all at least touching the liquid. Place the lid on the pot, lock the pressure valve to "seal", and set the pot for pressure mode, on high, for 4 minutes. Stir in the black beans, corn, cilantro, and cheese. Let the pasta sit for 5 minutes before serving. Garnish the pasta with additional cilantro, diced bell peppers, diced tomatoes, jalapenos, avocado, extra cheese, or sour cream (Greek yogurt). Any toppings that you like on a taco would work on this pasta too! Enjoy!